With only a few more weeks before the release of his fantasy debut, The Wanderer's Tale, here's a Q&A with David Bilsborough. For those who might be interested, just scroll down because I have five copies for you guys to win. The post announcing the giveaway was made last week. . . For more information about this title: Canada, USA, Europe. - Without giving anything away, can you give us a taste of the story that is THE WANDERER'S TALE? Despite the basic framework of the plot (the "epic fantasy quest") being far from original, that, I reckon, is where the unoriginality of my story ends. According to the quote I was kindly given by LE Modesitt Jr., "...Bilsborough has imbued the quest novel with a gritty realism..." Right on! That'll do for me. Yes, my heroes are foul-mouthed, go to the pub, smoke roll-ups, get divorced, do ca-ca in the woods, and, truth be told, after all that time on the road, smell pretty high. They also fight out of desperation and fear rather than bravery or honour, like thugs or butchers, and there's no glory, only blood and vomit. Nevertheless, it is a work of IMAGINATION; each character, creature and place is described in fine detail, either realistically or fantastically. Though clearly influenced by Nordic, Celtic and Central Asian folklore, I've endeavoured to sub-create a world of many new, diverse landscapes, cultures, languages and bizarre inventions. But the main inspiration for my writing comes from a lifetime of walking the Malvern Hills, one of the most fey and hauntingly beautiful places in the world, and the source of inspiration for writers, artists and composers for centuries. It's this facet, above all, that I want readers to enjoy. And maybe the odd bit of British toilet humour I've thrown in for good measure. 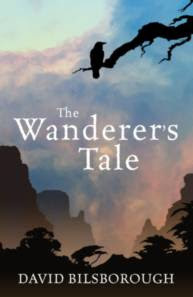 - According to some, THE WANDERER'S TALE might be the fantasy debut of the year. Are you happy to have such a positive buzz surrounding the book, or are you afraid that this might raise readers' expectations too high? - What can readers expect from the sequel, A FIRE IN THE NORTH? For a start, it's set in the North. So it's a lot colder. Probably why they lit the Fire in the first place. And it's a lot darker, in every way. Twisted, even. Annal Horribilis. I'm quite proud that there are bits in it which almost made my hardened editor spew. It's really in this second volume that the story starts to depart from the more usual 'fantasy epic', and strike out in a style of its own. Subsequent annals will continue this trend. And unlike some books these days, this story does not suddenly finish with the sort of disappointing abruptness that always leaves me wondering just how committed the author was to writing a great tale, as opposed to getting it over with before the deadline. Indeed, the epilogue is my favourite part of the entire duology. - What the progress report on A FIRE IN THE NORTH? Any tentative release date yet? - The cover blurb mentions that there will be many Annals set in the world of Lindormyn. How many different story arcs are planned at this point? I'm working on several different ideas at the moment, all very different in content to the first two annals. No wars, no quests, these stories should prove to be far more innovative. I'm hoping to break totally new ground. If I don't, there seems little point in writing. I'm determined to avoid churning out an endless slew of clone-like sequels ("The Wanderer Returns", "A Fire In The South", "Lindormyn 3: This Time It's Personal", etc.) like some kind of Lindormyn-o-matic. I've had quite enough experience of the production line in my life as it is. - Since THE WANDERER'S TALE is your fantasy debut, could you tell us a little of the road that saw this one go from manuscript to published novel? I finished the entire 441,000-word book - originally entitled "The Saga of Bolldhe the Great" (don't laugh) - in 2005. I started submitting synopses/samples to agents in July of that year, and after many rejections I thought I might as well have a go at submitting direct to publishers. By February 2006 I had received a grand total of 130 rejections from agents, and 60 from publishers. I gave up trying, quit my factory job (inspecting 1000's of little plastic tubes - boy was that fun) and decided to head back to Indonesia, where I'd taught in the 90's, to try to get my old job back. It was decided to split it into two volumes. Peter and I worked together on editing Book#1 in time for the Frankfurt Book Fair. There we got the US deal as well as the French and German translation deals. (Russia and Greece have recently been added.) The second volume was then edited, and checked by me here in Java, where I moved to in March. Descriptive writing is my real passion; it's what I've been doing since I was ten. It's important for the reader to be 'transported' into the story-world. So I go for ambience, be it sylvan beauty, shantytown seaminess, ghostly chill, or horrific aberration. Sorry about that. I just had to get that off my chest. I feel better now. Next question? - What was the spark that generated the idea which drove you to write The Annals of Lindormyn series in the first place? Sorry to be so unoriginal, but it has to be Tolkien. At the age of 15 I just had to write my own version of LOTR (as one does at that age) but came up with the idea of writing it in the style of Chaucer's Prologue to the Canterbury Tales, which we were studying at the time. I combined this with a not-too-serious idea my fellow nerds and I had been discussing all year, that of going on our own real-life D&D quest to Cheddar Gorge, complete with pseudonyms, costume armour and bicycles instead of horses. (Oh Lordy, am I really telling you this?) Seven years later it had turned into a 375-page epic poem, all in rhyme, and all of it the most unoriginal tripe imaginable. But I'd grown so fond of this tale and its quirky characters that I started rewriting it as a novel. I always tried to be as innovative as possible this time round, wiping out as many of the clichés as possible, but obviously being tied to the original poem I'd written, with its UNoriginal framework, the basic premise of "Wanderer/Fire..." is, I admit, somewhat 'traditional'. - Were there any perceived conventions of the fantasy genre which you wanted to twist or break when you set out to write THE WANDERER'S TALE and its sequel? Good vs. Evil. Heroes who are either "reluctant", "unassuming", "handsome" or (gag!) all three, who are always Good, always single/unattached, and always get the girl in the end. Beautiful heroines, skinny femme-fatale ninjas/sorceresses who wear nowt but brass brassieres and chiffon, or willowy, long-tressed Arthurian maidens who stand atop cliffs gazing out to sea contemplating their role in "a man's world" (Blech!). Gypsies who wear colourful silk and speak in rhyme (?!) The short, stocky, salt-of-the-earth sidekick who loves a good brawl and a pint. The strong, silent, mysterious, hooded stranger who sits alone in a darkened corner of the inn smoking. The quirky, croak-voiced and cowardly comic-relief character. Dashing rogues with wry smiles. Baddies in black. Evil magic-users. Slap-headed, bandy-legged, smart-arsed gurus who are always right. Exploding castles at the end out of which the heroes only just escape. Rather than either of those, I'd love to have my stories recognised in Scandinavia, the British Isles and Germany, as it's those cultural/folklore traditions that have inspired me, and those I really hope to be a part of. Apart from that, I can only think of two others I look up to. Graham Greene's concise summation of the human condition in all its boundless stupidity, need for self-delusion, and varying shades of evil, are themes I try to reflect in my own writing. And Michael Frayn for his sheer cleverness. So unfortunately I hardly read fiction at all now. Not because I don't like to, but simply because 90% of it is so disappointing - uninspired, predictable, cliched, and written mainly for money, i.e. all that Tolkien's writing is not. Like him, I teach for a living, and write for the love of it. I only ever write when inspired, or at least enthused; I will not hurry, compromise, or write for a target readership. Many people in the publishing world agree that there are far too many books being written nowadays, and maybe this is why. Even the most lauded bestselling authors seem to me to write as if they have a bland Hollywood film deal in mind. - Cover art has become a very hot topic of late. What are your thoughts pertaining to that facet of a novel, and what do you think of the cover that grace THE WANDERER'S TALE? I never stuck my oar in during the cover design stage; I always wanted it to be a complete surprise, like a Xmas present, seeing it on the day of publication. That said, Peter did show me the initial design a while back, and I was very relieved that it didn't conform to the stereotypical fantasy designs I hate so much. Both Peter and I always wanted to avoid standard clichés, wanting this story to appeal to a much wider, more general audience. So this cover, though having a wonderful and entirely apposite 'misty romance' about it, certainly does not scream "Fantasy" or "D&D", thank Grud. And the cover for "A Fire in the North" is even better. I don't see why it should be respected. With the obvious JRR exception, (and possibly Bernard Cornwell's "Starkadder / Vargr Moon") I have to say that I'm not the greatest fan of fantasy, at least not the swords & sorcery tradition with all its preposterousness and banality. I've read a fair few fantasy books in my life, and am always surprised that such stale, hackneyed and vapid pulp should get published at all. I particularly have problems with US fantasy; there are definite exceptions, of course, but in my opinion the Americans just don't get it, with their phoney Olde-Englishness, green tights, bucket boots, square-jawed 'Rone Garet' heroes, pretty-but-with-a-hidden-fire 'Fern Leah' love interests, hissing insidious black-robed 'Sith Mordax' villains, or whatever it is they harp on about in their hollow regurgitations of Conan, Star Wars or Buffy. Is it any wonder spec. fiction has so little respect? My favourite colour is puce. After reading this, and being the clueless american, I went straight to google to find out about Malvern Hills. I've decided to set a new goal following my cancer treatment: to visit this area, perhaps on a walking tour, and experience some of this kind of wonder first-hand. See, you never really know who or how you're going to touch someone with your words. Good luck to you. So should I pretend I haven't read this interview on the internet, thus not knowing about the book and so not having an interest in reading it, taking a chance I'll just see it in the bookstore and say, Oh this cover is pretty, think I'll buy it. Thanks for the interview (I laughed out loud) and thanks for your site, Patrick! Now Mr. Bilsborough, what do you REALLY think? Wow. Hmm. Wow. I have already read one review of this book that smashed and trashed it for the very same reason this person claims he hates the very genre he's writing in. I don't think I've ever read such a pompus and stupid interview by a new writer. Was he joking? What a way to insult half your possible readership population. I was eager to read this book but after reading that crap I might just pass. 90% of fantasy IS just regurgitated crap. It's just not politically correct to say that. Will I read the book? Yes. I had to laugh. This is how my brother talks; harshly when he feels passionatly about something. I will read the book when mum and dad send me a copy and post my true thoughts on this site following that. He won't read reviews so I can be as honest as I like. PS The Malverns are inspiring. Not the highlands of Scotland you understand, but in their own way, drawing. Way to insult American authors. I suppose he'll be happy if no one in the US buys his books, as long as he sells well in Europe. But still. What a dooooouche! Actually I DID see it in the bookstore and say "nice cover". After reading the synopsis on the inside cover I thought "why not?". Glad I did, the most original story I've read in a long time. Being a displaced american living in England for the last 8yrs I dont take what brits say about us to seriously...as long as he stays true to himself and the spirit of Boldhe DB can rant all he likes. I look forward to it...and more travels in lindormyn!